So...I slowed WAY down on this game in the month of July. I brought it to a solid L5/L6 defender and got it up to around 3800 trophies (bounces between mid-3600s to 3800), but have focused most of my playing time on the HV as well as my other games in general. I go in every so often now to clear collectors, run a few attacks, and start upgrades going but it will be backburnered in favor of my other games, becoming more something I work on during Clan Games (much like my other alts). The initial focus of this game was to show how quickly one could go from new to functioning BH8 without spending a fortune and while maximizing just one attack strategy. At first, I used RBs and SAs, but I quickly switched to Mass Beta Minions (BH4), which is my preferred strat. Later, I added in Drop Ships. As of right now, Drop Ships are L14 and should max by month’s end, even with my more casual play. On the defensive front, I first brought everything to L4 starting with a focus on the key defenses (Roaster, GC, MM, AB) then secondary defenses like the HTs, Crushers, FCs, DCs, and finally tertiary defenses such as the Cannons, ATs, GP. Traps and mines were something I would use to fill in when I was saving up resources for a larger upgrade. After that, the focus was placed on key defenses to reach L6. Secondary and tertiary defenses were brought to L5 and now I am bringing everything else to L5. Those who have followed my threads on rushing know that I prefer to bring everything to not more than 2 levels below my current level before upgrading to the next. As such, the right time to upgrade to BH8 on a normal rush would be when everything on the board was at least L5 (2 under BH7’s levels). As soon as traps/mines reach that point, all that remains is to go on my regular rushing path - key to L8, secondary to L8, etc. The Battle Machine (BM) has been out iff for some time. I went to BH8 with a L1 BM, but realized I really needed to get the ability to compete effectively for resources, so I took it to L5. Even at 3800 trophies, this is adequate to task. My typical run of attacks requires no more than 15 minutes daily and even with Coan Games, I’ve had little to no problems maintaining an effective trophy ranking. I experience the occasional losing streak, underdog matches, etc, it no more so than any of my other games. Of course, I gained access to greater resources more quickly by virtue of ascending in trophy rankings due to the faster deployment of buildings and levels. Walls were - as always - low priority. I did, however, want to get them to L4 to slow down the Bomber. Wall Rings took care of that. 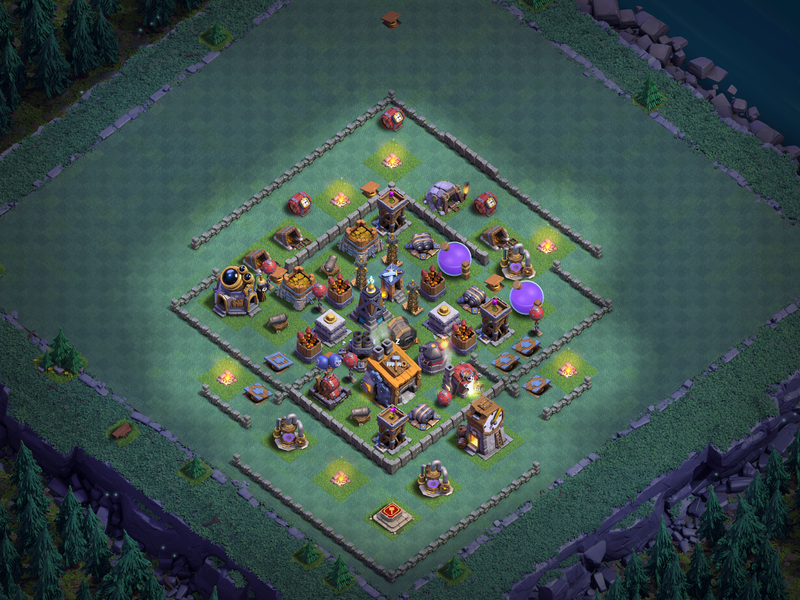 I used Gold on the first 3 levels, then switched to Wall Rings afterwards, focusing Gold on defenses. We had a couple of big reward sessions on Clan Games that provided the necessary Wall Rings. I even have some L5 walls in there now. This helps slow down the ground attack quite a bit. I’ve gone through several base designs and still change them fairly regularly. Sometimes a base will be 3-started over and over - just the other day, my base was 3-starred 4 times in a row. Most of the time, though, that is not the case and so long as I turn in a decent attack myself, I get through daily attacks in a reasonable amount of time (about 15m). On the HV side of the game, it is nearing max-TH8 (a bit better than halfway there, minus walls) and does well when I occasionally take it into Clan Wars. At this point, I think I’ll stop the regular journaling of the game’s progress as the original thesis has been addressed. Of course, I’ll still answer any questions and anyone who is interested can always bring the game up to look in on it. Long term, I will play on it periodically, likely maxing it before BH9 is released. The defensive focus will remain on the key defenses, followed by secondary, then tertiary, and finally traps/mines. I will come back to this thread in a few months with a formal update but that will likely be it until then. Hope you found this helpful! TH12 is out and what a doozy of an update this one is! SuperCell released another “update pack” pre-update that helps build the resources needed to run the upgrade.This one was $100US for 3 of each Rune (Gold, Elixir, Dark Elixir) and 160 Wall Rings that can be purchased twice; they also released a $50US version that has one of each Rune and 70 Wall Rings that can be purchased up to 4 times.Upon completing the upgrade, you get the standard level-up bonus pack that costs $20US and includes the Siege Workshop, 175K in Dark Elixir, and 8M Gold. The upgrade path for TH12 depends largely on your goals.In my case, I wanted to get the new troop (Electro Dragon), upgrade him to max, upgrade Bowlers and Valkyrie, drop everything new, and take the TH to level 5 (max). That turned out to be an expensive proposition. So - you made it to BH7. Awesome! That’s the latest and greatest, and it’s lots of fun. But what do you do now that you made it here? Never fear, I have here your upgrade guide! Hopefully, you continued to play each day while the Builder Hall was upgrading and now your Gold and Elixir Storages are either at, or nearly at, capacity. If not, you may need to adjust the below to include some raids but the sequence should hold up. Where you start your BH7 experience depends on whether or not you can pony up a few bucks for the level-up bonus pack. We've talked a lot about BH5 and what path I push my games along to get through BH5. That leaves us with the next topic - BH6. BH6 adds some new toys as you'd expect - there's a third Archer Tower, a second Crusher, and, of course the Roaster. You also get 4 new wall pieces, one mine, and one MegaMine. Step 1 - Drop everything that you get new at BH6. Right away, your initial focus needs to be getting the new defenses on the game grid. This is always the case when upgrading your BH because the new defenses will put you ahead of those you left behind at the previous BH level. Step 2 - Make the new stuff match the old stuff. Although I’ve talked a lot about BH5 and what I’ve done there, I’ve never really broken out a formal “Upgrade Guide” like I did with BH6.So, without further ado…here’s my BH5 Upgrade Guide! BH5 adds more fun, especially in the troop department.In a lot of ways, I really think the game becomes fun at BH5 and a lot of that is because you finally get your Battle Machine. Your new troop at BH5 is the Cannon Cart, but, to be completely honest, it’s not very useful.I’ve actually forgotten to upgrade the Barracks and I don’t upgrade the Cannon Cart in the lab at all. Note that this guide is geared toward players who are moving through the game at a more measured pace; those who are hyper-rushing will be following a different path (see my article on the art of hyper-rushing). Noc’s Upgrade Guide for BH8 I’ve been working on 5 of my games at BH8 over the first couple days of the release.What I’ve come up with are new bases with similar design concepts, new attack strategies that expand on previous strategies, and a firm resolve that upgrading in much the same way as other levels is the solid solution. 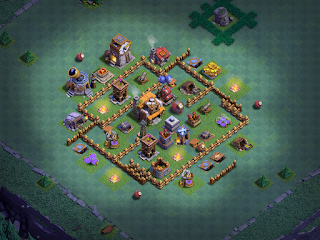 First and foremost - I’m hoping everyone fills their storages before hitting the upgrade button.This will enable you to upgrade and buy everything new that there is to buy from the Shop.Unlike previous upgrades, this upgrade is strictly buildings and troops - there are no walls to sap our resources. Welcome back to Part 2 of our BH6 Base Design series! This article takes a quick look at diamond shaped bases commonly in use among the upper ranked players of the game. I've used all of these at one time or another on one of my BH6 games and I have to say...they all work pretty well up and down the trophy rankings. As always - YMMV. The meta changes frequently and a base that works well today may suddenly be wiped out tomorrow. Be sure to visit Part 1 of our series where we talk about boxed style bases. Between that and this article, you'll have 17, solid BH6 base designs to use on your game. This is easily my personal favorite and the one I've had the best luck with across my games. The open design renders walls ineffective as blockades except to the far right side. 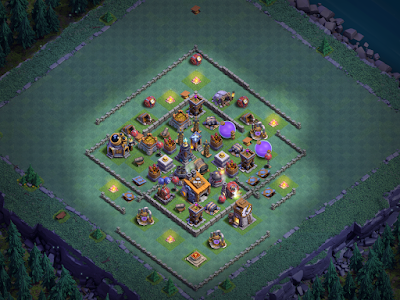 This base does well against most attacks and is rarely three starred, even at higher trophy rankings.